Many Americans, including Alejandra Casco, owe their lives to clinical trials. When standard courses of treatment don't prove helpful, patients and their care providers turn to trials. In many cases, trials help these patients and, later, countless others with the same disease or condition by advancing new therapies and treatments. In 2010, Casco and her family were living in Manchester, N.H., having emigrated from Honduras, in Central America, where she was born. That year, a trip back to her birth country would change her life forever and start her on a path to a long-term involvement with medical research. What happens when standard treatments fail? 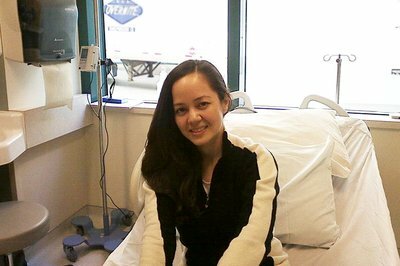 A young cancer patient's story shows how both public and private funding are vital to supporting medical research. While visiting family in Honduras, Casco, now 36, had a suspicious mole removed. A biopsy of the mole showed that Casco had melanoma, a potentially deadly skin cancer. When she returned to New Hampshire, a PET scan showed no signs that the cancer had spread. Still, she cancelled a planned move to Florida to remain close to her doctors. As the year went on, Casco began to feel weak. A second PET scan showed less favorable results. The cancer had spread to her lungs, liver, and bone; her diagnosis was Stage 4. She was referred to Dartmouth-Hitchcock Medical Center where oncologist Marc Ernstoff, MD, reviewed her case. LSL, scheduled for Nov. 3–7 in Boston, will feature content on medical research. Participating in Biomedical Research: Protecting Human Subjects and Engaging Individuals on Saturday, Nov. 4, from 10:30-11:45 a.m. Explore issues related to the paternalistic view of research subject participation and protection along with the benefits and challenges of engaging patients in the research process with changes in the research and regulatory landscape from the Common Rule. Making the Case for Medical Research on Sunday, Nov. 5, from 1:15-2:30 p.m. Explore successful strategies and opportunities to engage nontraditional partners to help demonstrate the wide-ranging benefits of public investment in medical research, including improved health outcomes and economic impact. Ernstoff explained her treatment options: chemotherapy, which would provide a limited benefit, or Interleukin-2 (IL-2) immunotherapy, a treatment that uses injections of a cytokine signaling molecule that is part of the body’s natural response to a microbial infection to fight off the cancer. IL-2 was originally researched and developed in the 1980s by the National Cancer Institute of the National Institutes of Health (NIH) and adopted in the mid-1990s as a standard therapy for both melanoma and kidney cancer. The cytokine involved in IL-2 treatment induces what is known as cytokine storm, a syndrome in which the immune systems activates too many immune cells in one place. In response, a patient’s blood pressure drops, body organs may appear to fail, and body weight may increase by 10%. “It’s a pretty miserable treatment to get through,” said Ernstoff. Casco remained hopeful and opted for treatment with IL-2, starting her first six-day cycle in July 2010. She received an infusion of the immunotherapy every eight hours during each cycle until the side effects—dizziness, reduced appetite, itchy and peeling skin, fluid retention, and weight gain—became too much for her body. Casco would proceed with another three cycles (one in August and two in December) and complete her treatment in January 2011. Her next set of scans, taken in March, showed that almost all the tumors had shrunk. Almost all. One tumor in Casco’s lung was not responding to the IL-2 therapy. The only treatment option left was available only through enrollment in a clinical trial. Ernstoff suggested a particular trial based on knowing the mutation in the BRAF gene associated with her cancer. He was optimistic about the treatment being used in the trial from early reports on targeted therapies. However, some patients responded well only for a short time. Casco summoned her resolve. “If there was a clinical trial, and I could do something positive, whether it was for myself or somebody else, then all I could do was go forward,” she recalled thinking. 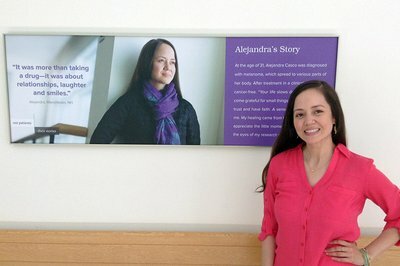 Alejandra Casco initially received immunotherapy to treat her Stage 4 melanoma but it was not completely successful. Every week for eight weeks, Casco would travel for an hour and fifteen minutes—even longer in the winter—from her home to Lebanon, N.H., to receive new doses. After a weeklong break, the cycle would begin anew. This would go on for four years. Casco was among 100 people who registered for the Phase 1 trial, funded by the drug’s manufacturer, which tested a multi-kinase inhibitor for use on advanced stage solid tumors. The basic science principles underlying kinase inhibitors were developed over many years using, in part, NIH funding. Clinical trials are conducted in phases. Each phase provides answers to different questions about a drug or treatment. Phase I: The safety an experimental drug or treatment is evaluated and side effects identified. A small group of 20 to 80 people participate. Phase II: The experimental drug or treatment is administered to 100 to 300 people to determine its effectiveness and further evaluate its safety. Phase III: A large trial population (1,000 to 3,000) is used to confirm the effectiveness of the experimental drug or treatment, monitor side effects, compare it with standard or equivalent treatments, and collect information that will allow it to be used safely. Phase IV: After the drug or treatment is FDA approved and made publicly available, researchers track its safety, seeking more information about risks, benefits, and optimal use. Unlike the IL-2, the trial medication did not take a huge toll on Casco’s body, but she was impatient as months turned into a year and wanted it to be over. “But I realized [thinking this way] wasn’t good for me; I just needed to surrender that time,” she said. Her relationships with care providers and staff were key in helping her remain positive throughout the long treatment trial, Casco added. In addition to Ernstoff, Casco remembers nurses who would ask about her recent trips, talk with her nieces, and offer encouragement during treatment. “It definitely helped me because I could just be myself and not put up any walls,” she said. Casco also enrolled in a writing group with other patients. She shied away from journaling at first but then discovered writing was useful. “It really has helped me to process certain things,” she said. In time, Casco’s scans showed only what appeared to be scar tissue. The medicine from the trial had worked, yet she continued taking a reduced dose because no one could say whether the cancer would return if she stopped the treatment. With the dosage reduction, Casco could again take the time to enjoy listening to music, reading, and being with the people around her. Eventually, in 2015, while visiting her sister, Casco felt it was time to come off the trial. “I remember watching several sunrises and sunsets, and I just finally had that peaceful moment where I knew… knew that I could go back home to New Hampshire, call my doctor, and finish this clinical trial. I knew that it was done,” said Casco, who continues to enjoy her cancer remission. Casco at Dartmouth-Hitchcock Medical Center, her cancer now in remission following her enrollment in a clinical trial. Ernstoff, no longer at Dartmouth-Hitchcock, is now professor and chief of the Division of Hematology/Oncology at the University at Buffalo Jacobs School of Medicine and Biomedical Sciences and chair of the Department of Medicine and senior vice president of clinical investigation at Roswell Park Cancer Institute. This article is part of the Bench to Bedside Podcast series, which presents stories of patients who have benefited from medical research. The podcast series supports the AAMC Research Means Hope campaign promoting the value of medical research and advocating for sustained, predictable federal funding for the NIH. The Bench to Bedside Podcast series presents stories of patients who have benefited from medical research. The podcast series supports the AAMC Research Means Hope campaign promoting the value of medical research and advocating for sustained, predictable federal funding for the NIH.